Apple, Crabapple, Hawthorn, Pear, Cotoneaster, Mountain Ash, Spirea, Quince. Fire blight affects succulent, vegetative growth. 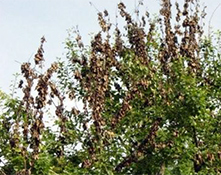 Dead, dry leaves persist on infected branches. 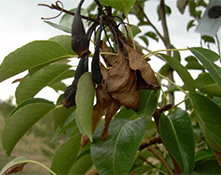 Major symptoms of fire blight appear during warm, moist weather in late spring, however, larger cankered limbs may not die back until dry weather during mid-summer. Milky-white to amber droplets of bacterial ooze may exude from infected plant parts. Cambial tissue is killed in the region of the canker and will be brown or black instead of green. Bark in cankered areas is darker than surrounding tissue and may appear sunken. Branches appear as if scorched by fire; branch tips curve downward in a characteristic shepherd’s crook. The bacteria overwinter in live tissue around the margins of Fire Blight cankers. Once the temperatures are above 16 degrees celsius bacteria resume growth and the disease can spread rapidly. Insects pollinating blossoms, rain splash or infested pruning tools can all serve as a means of spreading the bacteria. Succulent, rapidly growing plant tissues provide an ideal medium for infection. Infections can take place through natural plant openings such as lenticels or wounds. Choose resistant cultivars or non-susceptible plants as replacements. For managing fire blight in existing plantings where replacement is not an option, limit applications of nitrogen fertilizer and heavy amounts of pruning, which encourage the development of succulent growth. 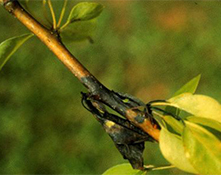 Prune only during dormancy and prune out infected branches about 30cms below the cankered area. Never prune when branches or foliage are wet. If minor amounts of infection are present, these branches can be pruned out during the growing season. Disinfect pruning tools between cuts with 10% household bleach. Spray bacterial products at early bloom, full bloom and petal fall where weather is warm and humid and Fire Blight is a recurring problem.